Below is my “Days Out” column from The Weekend supplement in the Saturday, September 21, 2013, issue of the South Wales Evening Post. Hit the slopes, Pembrey County Park! You don't need a holiday in the Alps to learn how to ski or snowboard - at Ski Pembrey, the dry slopes allow you to become an export without even going near a snow-covered mountain. There are two separate ski and snowboarding areas, which cater to all abilities, whether you are going skiing or boarding for the first time, brushing up on your technique or organising a group event, there's something for you. 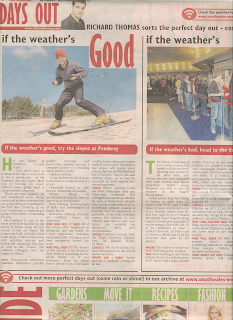 Ski Pembrey is one of the most up-to-date facilities in the whole of Wales. Open all year round, it has an Alpine Ski Lodge and Cafe, a floodlit 130m main slope, a 40m nursery area with sprinkler systems and button lift, mountain bike hire as well as the "Cobra", the ultimate toboggan ride- the biggest in Wales. WHY? Professional AAS/BASI qualified instructors provide quality coaching and instruction, whether you are a complete novice or a budding racer, adult or junior. Options include: Group ski lessons (book as an individual but taught as part of a group). Organised school or club lessons (minimum 12 people) . Instructor training (become an artificial slope ski instructor). WHO WILL ENJOY IT? The beauty of this activity is the location- there really is something for the whole family, so it is not everyone's keen on skiing there's plenty to do at the park: cycling, horse riding and nature walks to name a few. The thrill of the slopes will entice most young children and Ski Pembrey has a fantastic mogul run and nursery slope, so it can be accessed by both experts and young beginners. WHEN? Winter opening hours are from 10am-9pm daily and 10am-6pm weekends. The toboggan hire and shop will also be open at these times. Simply turn up for a recreational ski or snowboard without making a booking and all equipment is provided. A Saturday morning session for children is also offered and slalom runs and jumps are available for advanced skiers and snowboarders. WHERE? Pembrey Country Park Ski Slope, Pembrey Country Park, Nr Llanelli, Dyfed, SA160EJ. CONTACT: Tel: 01554 834443 for more information on the coast of classes and hire. WHERE CAN I PARK? Onsite parking is available costing £5 all day. The Odeon in Swansea is a 10 screen cinema. The inside is all on one level, allowing easy access for all who visit. The cinema has also been upgraded with large screens and digital projectors, which mean filmgoers are able to see 3D versions of the biggest blockbusters. Ticket prices vary but Friday to Sunday an adult ticket (18 years) costs £7.95 and a child ticket (12 years and under) costs £5.55. Student, senior (over 60) and teen (ages 13 to 17) tickets all costs £6. Don’t forget to bring a photo ID with you, especially if you’re seeing a film with 12A, 15 or 18 certificates or want a student discount. 3D Films cost £2 extra for adults and £1.60 for everyone else, plus £1 for glasses. WHERE? The Odeon is located inside the Park Tawe shopping complex in Swansea’s city centre. WHY? Now showing at the Odeon is Rush, rated 15 it tells the story of F1 driver Niki Lauda (Daniel Brühl), focusing on the rivalry between the reserved Austrian and charismatic English racer James Hunt (Chris Hemsworth). Also rated 15 is Riddick, an eye-popping sci-fi horror movie with some of the nastiest monsters ever seen on screen. CONTACT? To book tickets call the Filmline on 0871 22 44 007 or visit www.odeon.co.uk. There is an extra 50p charge for booking online or using the Filmline. HOW LONG WILL THIS TAKE? Most films run for about 2 hours, but arrive about 20minuets early so you have time to get some snacks. WHO WILL ENJOY IT? With 10 screens there's always something suitable for all ages, from younger children to students and seniors. WHAT ABOUT THE KIDS? Younger cinema goers will enjoy Monsters University, a prequel to one of the best animated movies of all time, Monsters Inc, rated U. HOW DO I GET THERE? For sat nav users the postcode is SA1 2BA. LUNCH? It wouldn't be the pictures without snacks. Popcorn, hot dogs, nachos, sweets and soft drinks are all available at the cinema’s snacks counter. Combos are available to save on costs. You can treat the whole family with Odeon's new Family Mix, which includes 2 Kids Mix, 2 medium drinks and medium popcorn to share, all for only £9.99. WHERE CAN I PARK? Free parking is available in the Parc Tawe Retail and Leisure Park car park. ANYTHING ELSE IN THE AREA? The cinema is right next door to Tenpin Bowling and other leisure sites including Plantasia and Lazerzone are close by if you want to do something after seeing your film. issue of the South Wales Evening Post. You don’t need Doctor Who's TARDIS to take a trip back in history. Voted the “finest natural wonder” in Britain by Radio Times readers in 2005, at Dan-yr-Ogof Showcaves you can visit an Iron Age farm or have a talk with famed cave explorer Tommy Morgan in his Victorian kitchen. Be warned, though, you might come face to face with tyrannosaurus rex or pterodactyl along the way! Early settlers farmed the land that the Dan-yr-Ogof Showcaves complex now occupies at the end of the Bronze Age, then approximately 3,000 years later, in 1912, local brothers Jeff and Tommy Morgan squeezed though a small gap in the hillside and discovered the spectacular Dan-yr-Ogof cave. Forty-one years later cavers made another discovery, Cathedral Cave, named after the awe-inspiring Dome of St Paul’s Cathedral. Bring a camera with you to take some dinosaur photos. Tickets cost £13.75 for adults and £8.50 for children 16 and younger. Children aged 2 years old go and younger go free and group discounts are available for groups of 20 or more people. WHERE? Located halfway between Brecon and Swansea inside the Brecon Beacons National Park, Dan-yr-Ogof Showcaves is approximately 25minuets from the M4, taking junction 45 and following the brown tourist signs north on the A4067 (Pontardawe). WHY? Dan-yr-Ogof Showcaves is one of the most breathtaking show cave complexes in northern Europe. There are three separate caves to explore: Dan-yr-Ogof cave, Cathedral Cave and the Bone Cave, where the remains of 42 human skeletons have been found. There is also an Iron Age village, museum and farm to visit. There are also a wide range of keepsakes available to buy in Rock & Dinosaur Shop. WHEN? Dan-yr-Ogof Showcaves will be open seven days a week now until Sunday 3 November 2013. The caves open at 10am, with tickets available throughout the day at the entrance until 3pm. CONTACT? Phone 01639730 284 or visit www.showcaves.co.uk. HOW LONG WILL THIS TAKE? You will want to spend the whole day at the showcaves. WHO WILL ENJOY IT? All ages are welcome inside Brecon Beacons National Park. Kids will enjoy will enjoy exploring the Dinosaur Park, one of the largest parks of its type in the world, with nearly 200 life-sized replicas of T. rexes, pterodactyls, brontosaurus and other prehistoric beasts that ruled the Earth 65 million years before mankind. 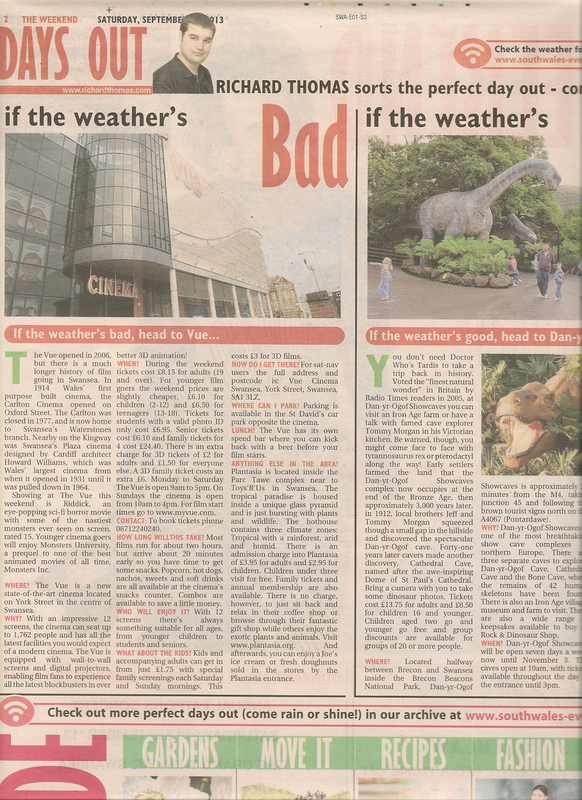 All the dinosaur models are outdoors, though, so don’t forget to bring a raincoat or umbrella with you just encase the weather changes, and wear suitable footwear for exploring the caves. WHAT ABOUT THE KIDS? There is an adventure playground for 6-10 year olds to play in. HOW TO GET THERE? For sat-nav users the postcode is SA9 1GJ. LUNCH? The coffee shop has a range of food and drinks, hot or cold, where you can relax and have a coffee while looking out on the breathtaking view of the Brecon Beacons. ANYTHING ELSE IN THE AREA? There is lots more to explore inside the Brecon Beacons National Park to see and do. Visit www.breconbeacons.org. The Vue opened in 2006, but there is a much longer history of film going in Swansea. In 1914 Wales’ first purpose built cinema, the Carlton Cinema de Luxe, opened on Oxford Street. The Carlton was closed in 1977, and is now home to Swansea's Waterstones branch. Nearby on the Kingway was Swansea's Plaza cinema designed by Cardiff architect Howard Williams, which was Wales' largest cinema from when it opened in 1931 until it was pulled down in 1964. Showing at The Vue this weekend is Riddick, an eye-popping sci-fi horror movie with some of the nastiest monsters ever seen on screen, rated 15. Younger cinema goers will enjoy Monsters University, a prequel to one of the best animated movies of all time, Monsters Inc.
WHERE? The Vue is a new state-of-the-art cinema located on York Street in the centre of Swansea. WHY? With an impressive 12 screens, the cinema can seat up to 1,762 people and has all the latest facilities you would expect of a modern cinema. The Vue is equipped with wall-to-wall screens and digital projectors, enabling film fans to experience all the latest blockbusters in ever better 3D animation! WHEN? During the weekend tickets cost £8.15 for adults (19 and over). For younger film goers the weekend prices are slightly cheaper, £6.10 for children (2-12) and £6.50 for teenagers (13-18). Tickets for students with a valid photo ID only cost £6.95. Senior tickets cost £6.10 and Family tickets for 4 cost £24.40. There is an extra charge for 3D tickets of £2 for adults and £1.50 for everyone else. A 3D family ticket costs an extra £6. Monday to Saturday The Vue is open 9am to 5pm. On Sundays the cinema is open from 10am to 4pm. For film start times go to www.myvue.com. CONTACT? To book tickets phone 08712240240. HOW LONG WILL THIS TAKE? Most films run for about two hours, but arrive about 20minuets early so you have time to get some snacks. Popcorn, hot dogs, nachos, sweets and soft drinks are all available at the cinema’s snacks counter. Combos are available to save a little money. WHO WILL ENJOY IT? With 12 screens there's always something suitable for all ages, from younger children to students and seniors. WHAT ABOUT THE KIDS? Kids and accompanying adults can get in from just £1.75 with special family screenings each Saturday and Sunday mornings. This costs £3 for 3D films. HOW DO I GET THERE? For sat-nav users the full address and postcode is: Vue Cinema Swansea, York Street, Swansea, SA1 3LZ. ANYTHING ELSE IN THE AREA? Plantasia is located inside the Parc Tawe complex near to Toys'R'Us in Swansea. The tropical paradise is housed inside a unique glass pyramid and is just bursting with plants and wildlife. The hothouse contains three climate zones: Tropical with a rainforest, Arid and Humid. 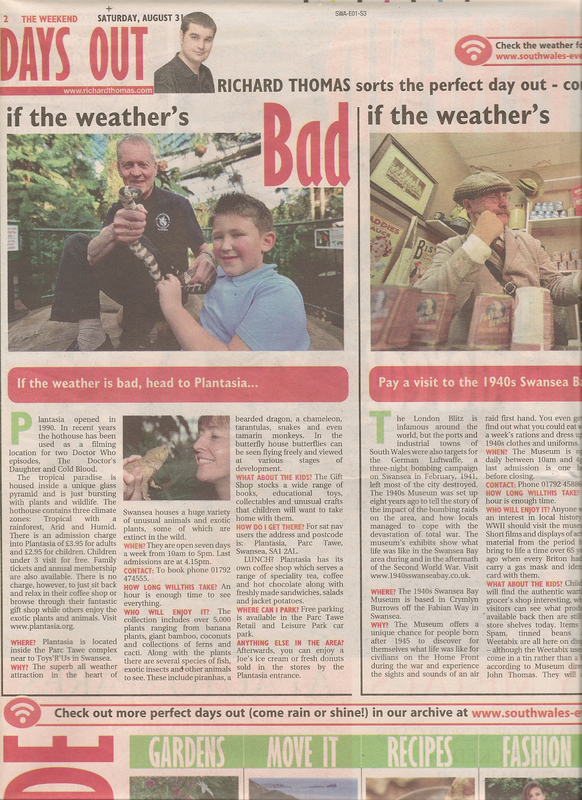 There is an admission charge into Plantasia of £3.95 for adults and £2.95 for children. Children under 3 visit for free. Family tickets and annual membership are also available. There is no charge, however, to just sit back and relax in their coffee shop or browse through their fantastic gift shop while others enjoy the exotic plants and animals. Visit www.plantasia.org. And afterwards, you can enjoy a Joe’s ice cream or fresh donates sold in the stores by the Plantasia entrance. 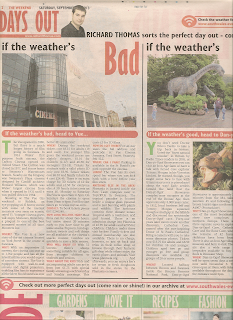 Below is my “Days Out” column from The Weekend supplement in the Saturday, August 31, 2013, issue of the South Wales Evening Post. Plantasia opened in 1990. In recent years the hothouse has been used as a filming location for two Doctor Who episodes, The Doctor's Daughter and Cold Blood. The tropical paradise is housed inside a unique glass pyramid and is just bursting with plants and wildlife. The hothouse contains three climate zones: Tropical with a rainforest, Arid and Humid. 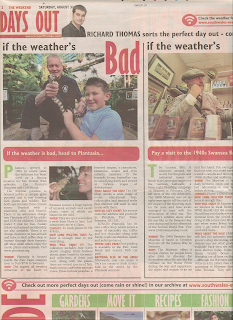 There is an admission charge into Plantasia of £3.95 for adults and £2.95 for children. Children under 3 visit for free. Family tickets and annual membership are also available. There is no charge, however, to just sit back and relax in their coffee shop or browse through their fantastic gift shop while others enjoy the exotic plants and animals. Visit www.plantasia.org. WHERE? Plantasia is located inside the Parc Tawe complex near to Toys'R'Us in Swansea. WHY? The superb all weather attraction in the heart of Swansea houses a huge variety of unusual animals and exotic plants, some of which are extinct in the wild. WHEN? They are open seven days a week from 10am to 5pm. Last admissions are at 4.15pm. CONTACT? To book phone 01792 474555. HOW LONG WILL THIS TAKE? An hour is enough time to see everything. WHO WILL ENJOY IT? The collection includes over 5,000 plants ranging from banana plants, giant bamboo, coconuts and collections of ferns and cacti. Along with the plants there are several species of fish, exotic insects and other animals to see. These include piranhas, a bearded dragon, a chameleon, tarantulas, snakes and even tamarin monkeys. In the butterfly house butterflies can be seen flying freely and viewed at various stages of development. WHAT ABOUT THE KIDS? The Gift Shop stocks a wide range of books, educational toys, collectables and unusual crafts that children will want to take home with them. HOW TO GET THERE? For sat nav users the address and postcode is: Plantasia, Parc Tawe, Swansea, SA1 2AL. LUNCH? Plantasia has its own coffee shop which serves a range of speciality tea, coffee and hot chocolate along with freshly made sandwiches, salads and jacket potatoes. ANYTHING ELSE IN THE AREA? Afterwards, you can enjoy a Joe’s ice cream or fresh donates sold in the stores by the Plantasia entrance. The London Blitz are infamous around the world, but the ports and industrial towns of South Wales were also targets for the German Luftwaffe, a three-night bombing campaign on Swansea in February, 1941, left most of the city destroyed. The 1940s Museum was set up eight years ago to tell the story of the impact of the bombing raids on the area, and how locals managed to cope with the devastation of total war. The museum's exhibits show what life was like in the Swansea Bay area during and in the aftermath of the Second World War. Visit www.1940sswanseabay.co.uk. WHERE? The 1940s Swansea Bay Museum is based in Crymlyn Burrows off the Fabian Way in Swansea. WHY? The Museum offers a unique chance for people born after 1945 to discover for themselves what life was like for civilians on the Home Front during the war and experience the sights and sounds of an air raid first hand. You even get to find out what you could eat with a week’s rations and dress up in 1940s clothes and uniforms. WHEN? The Museum is open daily between 10am and 4pm, last admission is one hour before closing. HOW LONG WILL THIS TAKE? An hour is enough time. WHO WILL ENJOY IT? Anyone with an interest in local history or WWII should visit the museum. Short films and displays of actual material from the period help bring to life a time over 65 years ago when every Briton had to carry a gas mask and identity card with them. WHAT ABOUT THE KIDS? Children will find the authentic wartime grocer's shop interesting, where visitors can see what products available back then are still on store shelves today. Items like Spam, tinned beans and Weetabix are all here on display - although the Weetabix used to come in a tin rather than a box, according to Museum director John Thomas. They will also enjoy the RAF plotting room, where you follow the course of the German bombers before taking cover in the air raid shelter. HOW DO I GET THERE? For sat nav users the address and postcode is: Baldwin's Crescent, Skewen, Swansea SA1 8PT. LUNCH? You can enjoy a spam sandwich and coffee in the gift shop cafe. WHERE CAN I PARK? There is free on site parking available. ANYTHING ELSE IN THE AREA? After visiting the 1940s Museum, Swansea Museum's Collections Centre in Landore is another good place to visit. The Collection Centre houses Swansea Museum's reserve collection which include some extraordinary exhibits from Swansea’s industrial and maritime past. The Collections Centre can be found next to the Park and Ride car park, opposite the Liberty Stadium, on the Cross Valley Link Road, Landore, Swansea, SA1 2JT. Visit www.swansea.gov.uk/swanseamuseum or phone 01792 653763.